Pulsating; absorbing; epic; a classic! 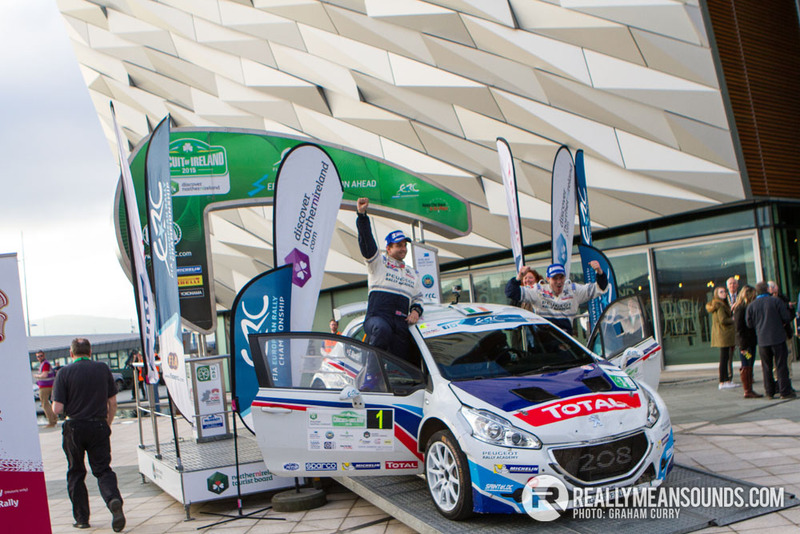 The 2015 Circuit of Ireland was unrelenting drama on wheels as Peugeot Rally Academy driver, Craig Breen and fellow Irishman Robert Barrable traded fastest times over the narrow, bumpy roads of County Down. Breen had spoken at length, prior to the event, about his desire to emulate his hero Frank Meagher and take home the famous ‘Circuit’ trophy. But Barrable clearly hadn’t read the script. A capacity entry headed through the early morning mizzle on Good Friday to tackle the first day’s stages in the Mourne Mountains. Amongst the protagonists were over 50 crews from the European Rally Championship (ERC), as well as competitors from the Clonakilty Blackpudding Irish Tarmac Championship and the Northern Ireland Championship. During qualifying on the previous day, Barrable set the fastest time, enabling him to run first on the road. Barrable’s performance had already torn up the pre-event form book – he hadn’t actually sat in a rally car since the latter half of 2014. On the first proper competitive stage, Barrable blasted off, posting a time that was 7 seconds quicker than Breen, underlining that his qualifying time was no flash in the pan. Alistair Fisher was third fastest, meaning that Irish drivers locked out all the top spots. The trend was set, as the overseas competitors found it hard to match the pace of the high class locals. ERC regular, Robert Consani had a new Citroen DS3 R5 for the event, but luck deserted him on the second run through Buck’s Head when gearbox problems put him out of the event. Consani would return under Rally 2 rules but that too, was a short lived appearance. The Fisher name has been synonymous with past Circuit of Ireland glories. Alistair Fisher had hoped to emulate his legendary uncle Bertie, but any chance of that expired when he had a nasty roll in his Fiesta R5 on the third stage. Irish Tarmac regulars and sibling rivals, Sam and Josh Moffett, more than held their own against European opposition with a string of top 5 times. Likewise, fellow Monaghan man, Stephen Wright shook off more experienced competitors and was firmly inside the top ten. Of the other ERC regulars, only Kajetan Kajetanowicz looked like making an impression on the sharp end of the leader board. He got steadily faster throughout day 1, as he grew accustomed to the rural roads of Northern Ireland. By the early afternoon, Breen had reeled Barrable in and passed him, after a fastest time on the roller coaster of Hamilton’s Folly. Although, intermittent mechanical problems and two horrendous runs through the Ards TT spectator special saw that lead evaporate. Only 1.5 seconds separated the pair at the end of the first leg and with 182 kms of closed road tests remaining, the scene was set for an all or nothing battle. In the hazy Saturday morning sunshine, Barrable was quickest out of the blocks and won the first stage of the day. By contrast, Breen admitted the opening stage had been a struggle. A very slow time by his standards meant Barrable’s Fiesta seized an eight second lead. However, on the next stage – McGaffin’s Corner – the longest of the rally, Breen struck back and was within 0.5 of a second of his rival. As Breen and Barrable slugged it out at the top, the 26km of McGaffin’s Corner proved to be the undoing of Stephen Wright. He had an off-road excursion, which brought his promising drive to a close. The same stage also sealed the fate of Ukrainian glamour model Inessa Tushkanova. Her appearance was much-hyped, but her times were slightly lower key. Tushkanova’s event came to a premature end when she obliterated a gate post at high speed. Likewise, Idris Elba may have ruled the mean streets of Baltimore, but he found the by-roads of Banbridge an altogether more difficult proposition. The acclaimed actor, who was filming a television documentary, collided with a hedge in his Fiesta and needed some substantial repairs to keep going. Meanwhile, in the main feature, Barrable and Breen continued to swap times throughout the morning, exchanging the lead several times. Both drivers were dealing in the finest margins. At one point, Barrable pulled out a 2.2 second lead, but Breen whittled that back to just over a second. With the final 3 stages in sight, disaster struck for Barrable. The Fiesta locked up on a slippery left hander and slid into a ditch. The damage was by no means terminal, but the car was beached and refused to move. His rally was over. With almost 20 seconds of a lead over third placed Kajetanowicz, victory for Breen looked assured. 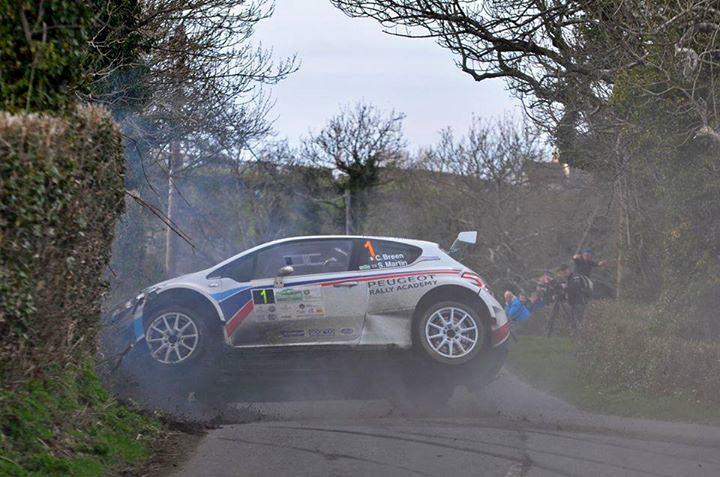 Realising your dreams never comes easy, which Craig Breen will attest. On the penultimate stage, a spin at the first junction lost him 15 seconds. A nervy final stage was punctuated by an overshoot and a stall, yet the Waterford man still set the fastest time. An emotional Breen admitted he had nothing left, as he broke down in tears at the stage end. The victory he had longed for was his. Breen now leads the ERC series from Kajetanowicz, who captured second place. Josh Moffett claimed third overall as well as family bragging rights over brother Sam, in fourth. In the Junior ERC section, Fermanagh’s Jon Armstrong had built a solid lead on Day 1, before a culmination of a 5 minute penalty and mechanical maladies ruined his rally. This left the Opel Adam of Bergkvist to take the honours from team-mate Marijan Griebel. Chris Ingram finished third in the Peugeot UK 208 R2. In the national section, Declan Boyle’s bad luck continued, when a blown engine meant he failed to finish his second consecutive Irish Tarmac round. This left evergreen Derek McGarrity to cruise to victory. Frank Kelly won the modified category and collected maximum ‘Tarmac’ points. 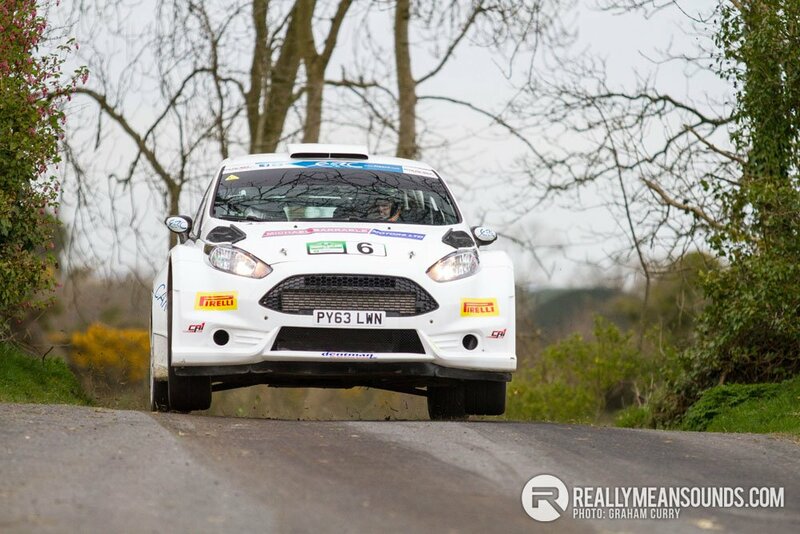 Elsewhere, Rob Duggan stormed to fourth overall in his Fiesta R2, which has bolstered his growing reputation. For more pictures of all the action, competitors and atmosphere, take a look at the gallery. Just to give you an example from a rally drivers point of view. In the likes of the European Peugeot 208 R2 cars and some of the ford m-sport focus cars, there is 2 buttons for the left and right indicator, that are down on the floor between the seats and hard to see without looking down. Once either is pressed, they flash for 24 times before turning themselves off. You cannot turn them off after you've pressed it, it goes for the full 24 flashes. It can thus give some drivers the wrong impression, as they stay on for so long. That's why most don't use them and then just move lanes when it looks safe to do so. Also the wing mirrors are incredibley small, they move all the time even after you set them. There is no interior rear view mirror in most cars either. The cars are normally Lhd and the reason they take their time to move lanes, is cos it's hard to see. Doesn't help when you get some "here's be me like mate" trying to race and tailgate you in traffic, when you genuinely can't see them and you've no time for that, because you've a certain time to get to the next location with your time card! Was up with the tiger risk guys for a few hours this afternoon, had a look around the other team garages also. Good day out and something a bit different for me as i aint been to a rally event before. The wifes uncle is a mechanic for tiger risk so got a good insight to the workings of the team etc, very interesting. Excellent pics @Graham, is Coverage of the rally being televised do you know? | Excellent pics @Graham, is Coverage of the rally being televised do you know? Good to meet you too @Graham @Artoir not sure if you stayed until they pulled the Swedish 208 out of the hedge but the crew tidied up afterwords and you would hardly know a car had went through it. Only broke 1 tree.